With their ground-breaking introduction several years ago of the all-dielectric 2" Maxbright star diagonal, Baader Planetarium brought mirror star diagonals into the 21st century. The new 2" Clicklock Star Diagonal takes this innovation another step further. Like its predecessor, the 2" Clicklock Star Diagonal uses proprietary Baader all-dielectric mirror coatings. The Baader coating process eliminates the Achilles Heel that has plagued other all-dielectric mirror coatings - normally the multi-layer coating results in high surface stresses that cause a star diagonal's mirror to warp as much as 1/2 wave, ruining the figure and distorting the optical wavefront. Baader's proprietary coating process maintains the 1/10 wave mirror surface accuracy - after coating! Baader's dielectric coatings deliver an amazingly high 99% photo-visual reflectivity along with an extremely hard durable surface. The ultra-hard mirror coatings will last lifetimes without losing reflectivity, and may be cleaned with normal care, without fear of scratches. The precision mirror is also oversized, and combines with the large ID nosepiece to pass the largest image cone possible in a 2" format. The new 2" Clicklock non-marring eyepiece holder delivers the same acclaimed simplicity and security as its smaller 1.25" Clicklock cousin. With an effortless 20 degree twist of the rubber knurled ring (which also includes a convenient fingertip lever) , the clicklock holder clamps 2" eyepieces so securely you can lift your scope with them. The unique action utilizes 3-point clamping which positively and accurately locks 2" eyepieces without any of the wobbling and misalignment that can occur with single point clamps. The Baader 2" Clicklock Star Diagonal incorporates another unique feature. The 2" nosepiece can be removed, to expose a 2"x24tpi SCT female thread, permitting integration of the diagonal into additional configurations through the use of the Baader Astro T-2 System components (sold separately). 4.8 (Based on 12 Reviews) 100% of reviewers recommended this product. Great product, great price, fast shipping. What more could you want. Very high quality, and the ClockLock mechanism is perfect. The Baader 2" Clicklock Maxbright diagonal is a mixed bag. I'll start with the positives. It has a short nosepiece. Why is this important? 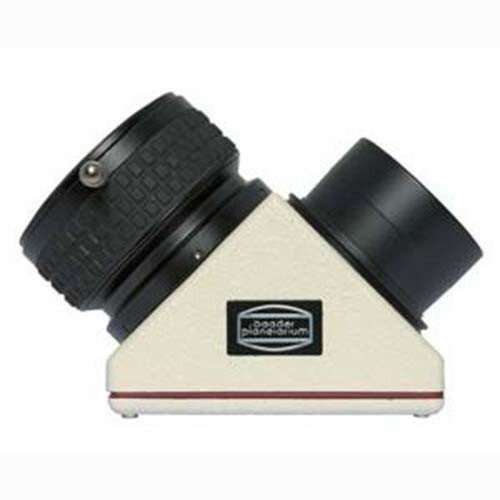 When used with an SCT in particular this reduces backfocus compared to a longer "refractor style" diagonal nosepiece. For me this is critical as I use the diagonal in a C9.25 Edge HD SCT. In the 9.25" model the Edge corrective optics are far back in the baffle tube near the rear port. So far back in fact that a long nosepiece diagonal would contact and scratch and/or crack the rearmost element. The clicklock mechanism is also very secure. That's about it for positives. Oh, other than the cream and red color scheme is distinctive and attractive (at least to my eye). Now on to the negatives. The housing is flimsy. Thin and tinny. The modular design allows the nosepiece to unscrew from the body with a tall heavy eyepiece in the diagonal, causing the eye lens to swing around and point at the ground (terrifying). The mirror is nothing special. No brighter than and no higher contrast than the bulk of Chinese and Taiwanese dielectric mirror diagonals. The price is an uber-premium that is not matched by the build or the optical quality. Diagonals like the Astro-Physics Maxbright and Televue Everbrite are solid, unitary products machined from billet and are much sturdier with large payloads in the diagonal. Unfortunately Televue discontinued the short-nosed version of the Everbrite, and A-P has never offered a short nosepiece version of its diagonal. Both are better designed, bettter manufactured and less expensive than the Baader. So I recommend this product only for a fairly narrow set of circumstances - namely the need for an optically acceptable diagonal with a very short nosepiece for SCT use. I'll give the clicklock mechanism an "honorable mention". If you could pair the clicklock machanism with a solid, machined, non-modular body and a superior mirror, the resulting product would be worth using for any diagonal needs and the price being asked for the current design would be worth it. 5.0 How have I lived without this for so long? This is a high quality diagonal with fit and finish well beyond the stock diagonal Celestron provides with their Edge HD 1100. That alone would make it an outstanding product, but the click-lock mechanism has changed the way I use eyepieces. It used to be awkward to swap eyepieces while observing, especially when cold. The tiny thumb screws are often hard to turn, and eyepieces with undercut barrels always seem to catch when inserting or removing them. Once in place heavy eyepieces often twisted about as the thumbscrews failed to hold their weight. As a result I usually picked one eyepiece for a target and stick with it. But the click-lock changes all of that: a simple turn of the ring and the eyepieces come out, and another turn and they are locked tightly into place. Now I change out eyepieces regularly with each target, enjoying the views each FL provides. Review by Tom of Cranston RI. I install it at the end of my C8 OTA, and the whole length shorted for a little, maybe you just need this small amount to let the tube goes vertical, I did. Before that my tube cannot in the very vertical since the length is a little too long and will hit the base if in full vertical. Need small hex screw driver to de-assemble it before install, since it will hit with focus nub. A high quality mirror diagonal with top notch finish. The clicklock makes a huge difference and its a definite advantage over other diagonals. A must have item for every astronomer. Review by Wootieli of Conyers, GA.
Bought this for several reasons, a primary one being the Clicklock feature. Did not disappoint. Quality is excellent, views are excellent. I am using Baader Hyperion EPs. I LOVE the Clicklock! It really is strong enough to hold it and support the weight of my 8" Celestron Edge, like one of the picture shows (don't recommend it though). I was surprised that they didn't have a version with Clicklock at both ends. I bought a separate one for the scope end, reason being, it's a snap to rotate the diagonal without thumbscrews. Review by Pentax Syntax of Maryland. The Baader was chosen because of the release mechanism and its full aperture for 2" eyepieces. I can assure potential buyers that the Clickstop has a FULL 2" aperture and is one of the few diagonals that do. This will only matter to those using eyepieces with a field stop of greater than about 42 mm. On my Pentax XW40 and Meade 56mm Plossl, the 46+ mm field stop larger than almost all diagonals but the Baader. If you want complete illumination from a refractor or a >10" SCT, this is a good way to go. Review by herrointment of Chetek, WI. Grabs and holds all the ES 100 EPs without worry or fuss. A fantastiic product that impresses with each use. Hang-ups are a distant menory with the Clicklock. Pick up a few Anteres Twist-Lock Adapters for your 1 1/4 inch EPs and you'll wonder why you had to struggle switching out EPs for all those years. Worth every penny. Review by stargazer of Canfield, Ohio. Absolutely THE best Diagonal out there. Beats all the others hands down. No shortcuts here, just a high quality piece that would fit that "must have" upgrade. Works perfectly on my C9.25 SCT and my 4.3" Refractor. No light falloff, and clear across the field. Review by Dr.Doc of Alberta, Canada. The Baader Clicklock is by far the best barrel retaining method in the industry. Very strong and easy to use, a quality component. If only it came in black.